Most people begin to grow plants and soon realize they are becoming passionate gardeners' all for a single plant. That is a sure sign that Mother Nature has taken her grip in the growers life and the rewards will follow. To take the step from being a grower to being a hobby breeder is a lot more interesting and rewarding. It makes the grower feel like he or she is in some way making decisions that will in someway change things forever. It draws the grower a little closer to the creative processes in nature and a fuller understanding of the evolutionary processes. 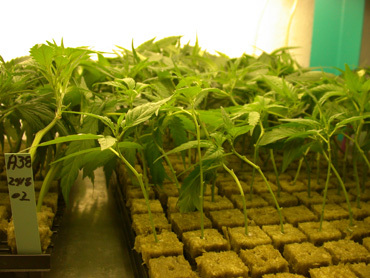 This makes growers into the hands of Mother Nature, and fully involved in the fundamental processes of plant evolution. It kind of helps one understand god in a small way. All plants used in modern day agriculture have evolved down the ages by selective breeding. Whether it is for the yield or the taste or the shape or the medicinal uses or whatever, a human has in some way made a decision to select that trait in that plant rather than something else. All these small decisions have slowly changed the plant over a long time and lead us to the plants we use in modern day agriculture. This applies to the Cannabis plant, probably more so than in any one singular family of plants, due mainly to its thousand of years in cultivation. Add to that factor that it is spread over the entire globe and can be cultivated in short times compared to normal crops, plus the fact that people have been selecting for specific flavors, medicinal effects, yields, shape, etc. have attributed to make Cannabis what it is today. In natural methods of pollination it would be extremely unlikely that a male Brazilian cannabis sativa would have been able to mix its genetic makeup with a South African sativa. But humans have acted like the bumble bee and taken seed from one country to another and so on, making nature's processes speed up or even put together what may never have been able to occur naturally. Humans have selected certain seeds for certain reasons and tried to bring new combinations of genetics into a restricted gene pool expanding the combinations and possibilities. It has lead us to the current situation of having well in excess of 1000 hybrids of Cannabis sativa/indica, whereby their origins: the landraces have been combined in varying amounts to manifest sub-species. Of course up until present day, most world governments do not recognize most hybrids of Cannabis since in most countries it is illegal to grow out seed of this plant. However, in the handful of countries where it has been possible to work on hybridization the research has progressed at a good pace. Without recognition by authorities that these hybrids exist, as well as having no regulation within the Cannabis seed producers, it makes it difficult for the end user to really be sure of what he or she is buying. There are quite a few very honorable companies that test their products before going to market and back up their products on active helpdesks, so it really is buyer beware! Doing a little research on the company you choose to purchase your seed from as well as asking fellow growers on cannabis related sites as to the quality and types of products that have been publicly tested will enable the end user to get a clearer picture of what he or she is really dealing with. Paying money for seed that only carries a name and not the genetics is like buying a Ferrari without the engine... you are going nowhere quickly.